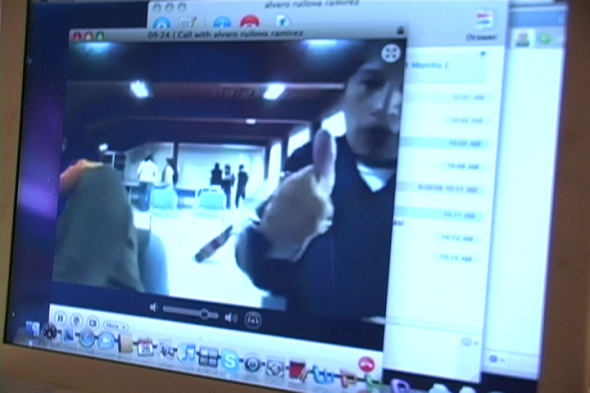 A student in Bolivia gives a thumbs up. Watch this documentary about an amazing international art project. 9 works of art were made by high school students. The students were selected from three different countries, Mexico, Bolivia and the U.S. The students were from two diverse neighborhoods in one city (here, it was North High School from Denver and Columbine High School from Littleton) They were asked three questions about stereotyping and prejudice and responded by making art with nine different teaching artists and then shared their responses through Skype and gallery exhibits. The project was hosted by Museo de las Americas in Denver, Colorado, U.S.A. It was one of the coolest projects I’ve worked on. What was so neat, aside from the amazing and talented students, were the amazing and talented artists and the camraderie we shared, spanning nations, politics and pretenses. That planning meeting in La Paz was fun however walking up stairs was never so difficult. This entry was posted on Saturday, May 22nd, 2010 at 8:00 am	and is filed under Professional Video Services, Video Gallery. You can follow any responses to this entry through the RSS 2.0 feed.